Each day in interior design we are influenced by the world of fashion. We are constantly being inspired by the latest fashion trends whether it is playful prints, lavish silks, detailed embroidery, or even sleek textiles and fabrics. We are constantly morphing what we see in fashion and projecting those ideas into our clients' home. We love to have new and innovative design and by keeping up we the latest trends, we feel that we are constantly finding new muses and inspiration that we can incorporate into our work. Each week we will be posting our latest inspiration. This week we are feeling inspired by the Dolce & Gabbana Spring 2016 Ready to Wear Collection. Everything from the stripes to embroidery we believe can be strategically placed in the home to make just as much of an impact as it does on the runway. Does your fashion sense inspire your home? After hearing Miles Redd speak at the Decorative Center in Houston last week, we have been inspired and moved by his eclectic style and splashes of bold color. As we are developing our own projects, we continue to look to Miles Redd on how to create an interesting space that integrates beautiful antique pieces into a modern day setting. We see the importance in exploring new patterns, color, and a plethora of textiles. 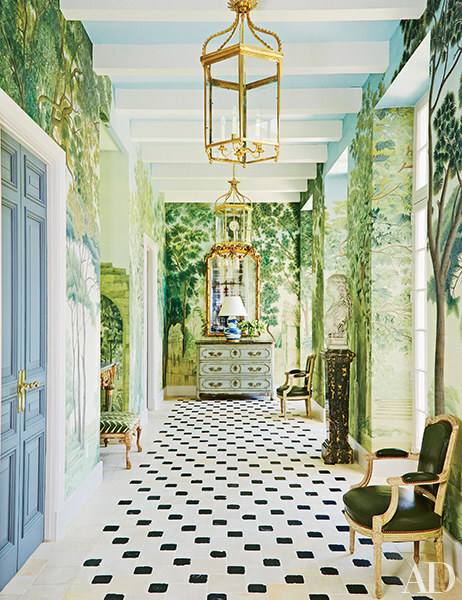 While researching the works of Miles Redd, we came across this beautiful Houston home, that we quickly grew to love. As Miles Redd continually expressed during his speech, the effectiveness of being inspired by others never fails to spark new ideas. As seen in the pictures below we love how Miles Redd always keeps true to his eclectic and thought-provoking style.